BEIJING — China's Tsinghua University, revealed by an American spy agency contractor to be a target of U.S. surveillance programs, is home to the country's oldest Internet hub and routes traffic from tens of millions of users. The alma mater of many of China's top leaders including President Xi Jinping and former President Hu Jintao, Tsinghua's campus in northwestern Beijing hosts the China Education and Research Network (CERNET), one of China's six major backbone networks, according to state media. “Tsinghua is known as the 'MIT of China',” said Duncan Clark, chairman of Beijing-based technology consultancy BDA, referring to the premier U.S. university, the Massachussetts Institute of Technology. But, in an interview with the Communist Party-backed Beijing Youth Daily, an unnamed official from Tsinghua's information department denied that it was the target of a U.S. cyber attack, saying that “reports that Tsinghua was hacked into are inaccurate”. 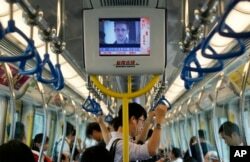 A TV screen shows the news of Edward Snowden, a former CIA employee who leaked top-secret documents about sweeping U.S. surveillance programs, in the underground train in Hong Kong Sunday, June 16, 2013. On Saturday, Hong Kong's South China Morning Post newspaper said documents and statements from the contractor, Edward Snowden, indicated the NSA had hacked major Chinese telecoms companies to access text messages, attacked Tsinghua University, and hacked the Hong Kong headquarters of Pacnet, which has an extensive fiber optic submarine network. Snowden, who is wanted by the United States government, fled Hong Kong on Sunday to Moscow. He has asked for asylum in Ecuador. Set up in 1994, CERNET was designed to provide Internet services to China's educational institutions, according to its web site. It connects 160 cities in China and more than 2,000 of China's universities and research institutes, including Beijing's other top university, Peking University, and Shanghai's Jiaotong University. CERNET, which is operated by China's ministry of education, says on its website that it is China's “largest non-profit computer network and hosts the world's largest national academic network”. Luo Ping, a professor of Internet security at Tsinghua, said he had warned in research papers about U.S. attacks on China's backbone networks about five to six years ago. “Those of us who do network security have known very early on that the National Security Agency has entered the backbone networks in China,” Luo said. He did not however specifically comment on Snowden's claims. In 2007, local media reported that Tsinghua's network had sustained large-scale virus attacks in 2006 and again in 2007, affecting over 10,000 computers on campus. The university was forced to shut down many infected computers to contain the virus. “I believe they've taken some measures, but are still relatively weak,” Luo said. China on Sunday expressed “grave concern” over Snowden's allegations that the United States has hacked into Tsinghua and Chinese mobile network companies, and said it had taken the issue up with Washington. When asked why Tsinghua could have been targeted by the United States, foreign ministry spokeswoman Hua Chunying said at a regular briefing on Monday that she was “not in a position to answer this question”. “Ask the party who conducted the attacks,” Hua said. Both China and the United States accuse each other of cyber attacks and the issue was top of the agenda when President Barack Obama hosted Xi at their first summit earlier this month. China later said it wanted cooperation rather than friction with the United States over cyber security.